One hundred years ago, during the 1912 Olympics in Stockholm Sweden, Alma Richards of the United States took home the Gold medal in the men's high jump by clearing a bar of 6 feet 4 inches. Today, the world record, set in 1993 by Javier Sotomayor of Cuba, is 8 feet 4.5 inches. 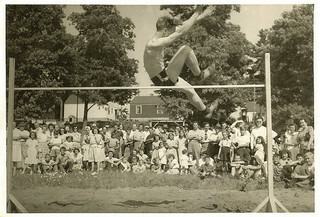 In the eighty one years between 1912 and 1993 the world record for the men's high jump was broken forty seven times. Each time the record was broken, it was by a very small amount as each generation of athlete would realize what heights were possible and then would try to exceed themselves by pushing the record just a little farther. The men competing in the 1912 Olympics were no less athletic and were no less talented than those that competed in later generations. As they pushed themselves to move the bar higher inch by inch, as they continued to refine their technique, and as they rejoiced each time that they reached their goal, they simply did not know what they were truly capable of achieving. Had you told one of those athletes in 1912 that, within a few decades, men would be jumping a full two feet higher than them, you would have probably been met with scoffing and disbelief. They would have claimed it to be impossible and would have doubted your grasp of reality. We are called to worship and praise a God that has set some pretty high standards for us too – standards which to many people seem impossible. We are told that to hate someone is to be guilty of murder and to even look at a woman with lust is to commit adultery. Like the athletes in 1912 who didn't know what they were capable of, our society tells us that the bar of God's teaching is way too high and that to control ourselves to that extent is simply not possible. As an atheist, one of the objections I had to Christianity was the idea of a god that demanded worship. Any god that is so conceited and insecure as to require my worship, I said, is not a god I am interested knowing. What I didn't understand at the time is why God requires our worship. It is not for His sake, but for ours. We worship God because He is the only thing that is worthy of our worship and as we take our eyes off of the things of this world (and the lowly standards they represent) and cast our gaze upon Him we begin to understand what we are really capable of and we begin to strive for a higher standard – a standard that we were created to achieve and to maintain. Like the Olympic athletes of the past century, we cannot expect to reach our ultimate goals immediately but must instead make small and steady progress toward a goal, the ultimate 'height' of which is unknown to us. Each day we must press a little farther and take the next step forward, constantly keeping our gaze on the one who gives us strength and encourages us to press on.